V/Q scans are ordered primarily to assess the probability of acute pulmonary embolus. This study is preferable over CT angiography for patients with contrast allergy, renal failure, or those too large for the CT gantry or bed. This study may also be preferable in young patients (especially women) due to lesser radiation dose and those with clear lungs on x-ray. Mettler FA and Guiberteau MJ. Essentials of Nuclear Medicine. 6th ed. Philadelphia: Elsevier Saunders, 2012. "VQ Scan." Nuclear Medicine - Another Way of Learning. Updated 4 Jul 2009. URL: http://aneasierwayoflearningmedicine.blogspot.com/2009/07/vq-scan.html. Because normal pulmonary arterial blood flow is dependent (by gravity) and dorsal (by arterial architecture), an upright patient's normal Q scan will show tracer distribution increasing in a gradient fashion from superior to inferior and anterior to posterior. A near-normal Q scan, like a normal Q scan, predicts a very low to no probability of acute PE. 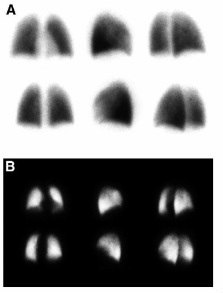 Abnormal lung shape will usually be due to extra-pulmonary abnormalities, and the Q scan is interpreted as "near-normal" if tracer distribution is otherwise physiological. 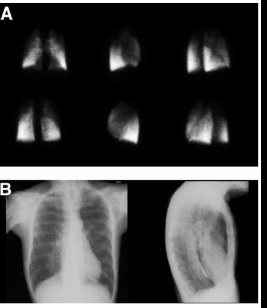 A common example of a near-normal Q scan is where the lung shape is abnormal due to an enlarged heart, which can be confirmed with a chest x-ray, and where perfusion tracer distribution is otherwise physiological. This is seen in the above Q scan. 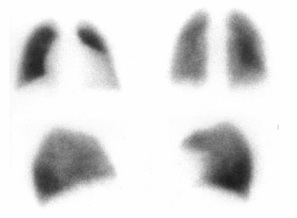 Another example is when the expected tracer gradient is not seen, but the tracer distribution is without discrete defects and the lung shape is normal. This indicates that pulmonary arterial blood distribution is altered due to remodeling from pulmonary arterial hypertension. 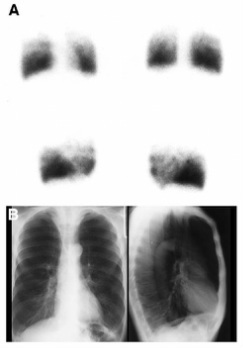 The segmental or lobar perfusion defects of acute pulmonary embolic ("PE") disease are classically wedge-shaped. According to the modified PIOPED criteria, a Q scan must show at least 2 "large" or segmental wedge-shaped defects that are mismatched (meaning without correlating wedge-shaped defects on V scan or chest x-ray) to be interpreted as "high probability for acute PE." The PISAPED criteria states that if a wedge-shape defect is present, the Q scan is interpreted as "PE present." If the perfusion defect is not wedge-shaped, it should be regarded as "PE absent" whether or not there is a corresponding defect (or lesion) on chest x-ray. 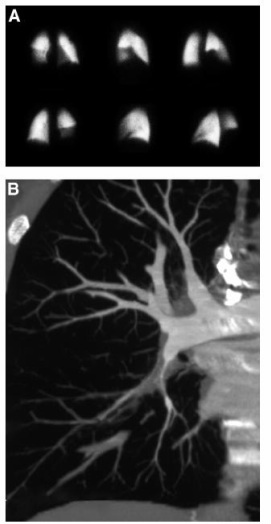 The 4 sets of Q scans (one above and 3 sets to the bottom) show various patterns of small to large wedge-shaped perfusion defects located at the periphery of the lungs, which is highly suggestive of acute PE. Pneumonia, lung cancer, alveolar edema, interstitial lung disease, and COPD can cause non-wedge perfusion defects. 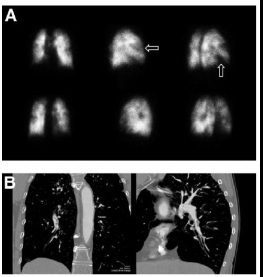 COPD may be the most common disease associated with non-wedge perfusion defects and has a variety of perfusion defect patterns, from irregularly decreased tracer activity diffusely to the presence of large and usually symmetrical non-wedge perfusion defects (indicating significant emphysema). A perfusion defect pattern associated with COPD does not by itself rule out concurrent acute PE disease. 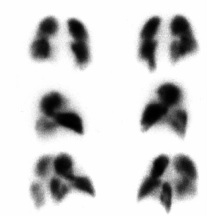 Three sets of Q scans (the one above and 2 at the bottom) show non-wedge perfusion defects of COPD. The Q scan to the bottom right show significant non-wedge defects in the bilateral upper and mid lung fields, which are caused by the severe bullous emphysema seen on the associated chest x-ray. 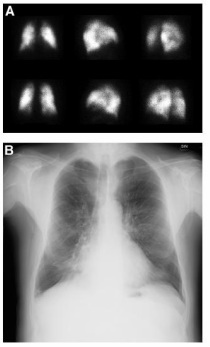 Pneumonia is associated with various non-wedge perfusion defect patterns, from an unilateral focal non-wedge defect or diffuse and irregularly decreased perfusion activity corresponding to chest x-ray findings. A lung tumor will appear as a non-wedge perfusion defect and can easily be correlated to its location on chest x-ray or CT exam. Below are four sets of criteria for interpreting V/Q scans (and chest x-ray). Note that 2 criteria sets require only a perfusion (Q) scan and chest x-ray. Within the table, the grey-colored lines are the impressions (e.g., "High Likelihood Ratio", "PE present"), while the white-colored lines are the descriptive qualities on the scans that confer a specific impression. To see a larger image of the table, click the table. To see the source document, click on the SNM link just below the table. 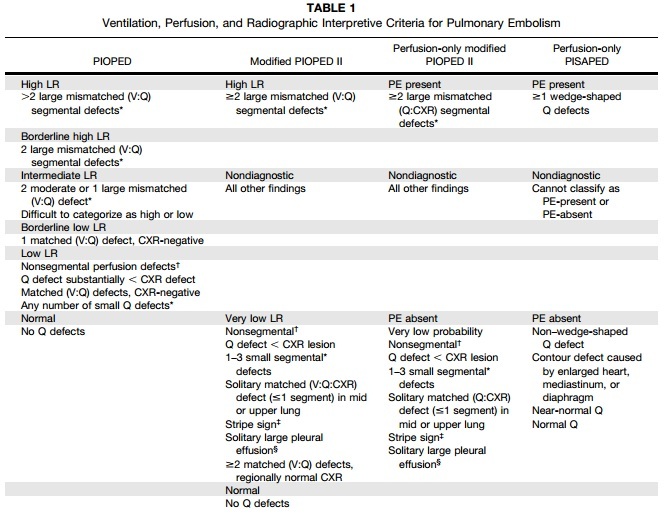 Clinical probability of pulmonary emboli (PE) should be considered when factoring in V/Q scan interpretations as pre-imaging probability affects the accuracy of the interpretation. 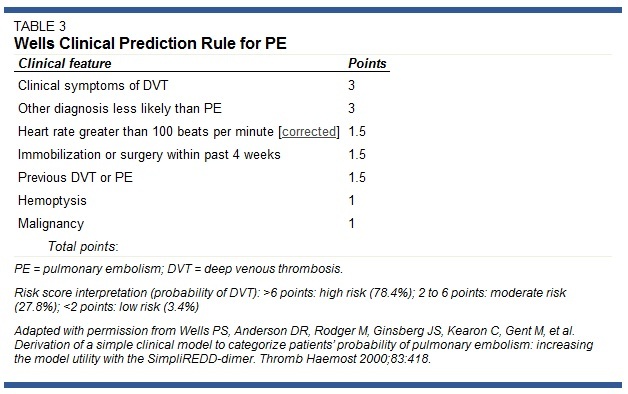 The most common clinical criteria for determining pre-imaging probability of PE is the Wells Score. Many clinicians consider a negative D-dimer result combined with low-pretest probability of PE by Wells criteria negative for acute PE, thus preventing the need for further assessment using imaging. Click here for the MDCalc online calculator of the Wells Score. Roach PJ et al. "V/Q Scanning Using SPECT and SPECT/CT." J Nucl Med 2013; 54:1588–1596. Lu Y et al. "Non-contrast Perfusion SPECT/CT – A New Test for the Expedited, High Accuracy Diagnosis of Acute Pulmonary Embolism." Chest. 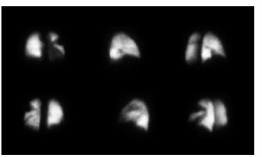 2014. doi:10.1378/chest.13-2090. Miniati M et al. Perfusion Lung Scintigraphy for the Diagnosis of Pulmonary Embolism: A Reappraisal and Review of the Prospective Investigative Study of Acute Pulmonary Embolism Diagnosis Methods. Sem Nuc Med 2008; 38(6): 450-461. Saint Vincent Hospital's "Interpretation of V/Q Scan for Pulmonary Embolus."